A few days after Valentine's Day the kids and I went to the grocery store. Next to the door they had all of their Valentine clearance items and Carson spotted a heart necklace that would light up. He loved it and since it was really cheap I got it for him. Well, the poor boy only got to play with it for a few minutes and then his little sister hijacked it from him. She carried it around for days and constantly had it. When she crawled anywhere it was in her mouth and if Carson tried to play with it she would scream. It became hers. 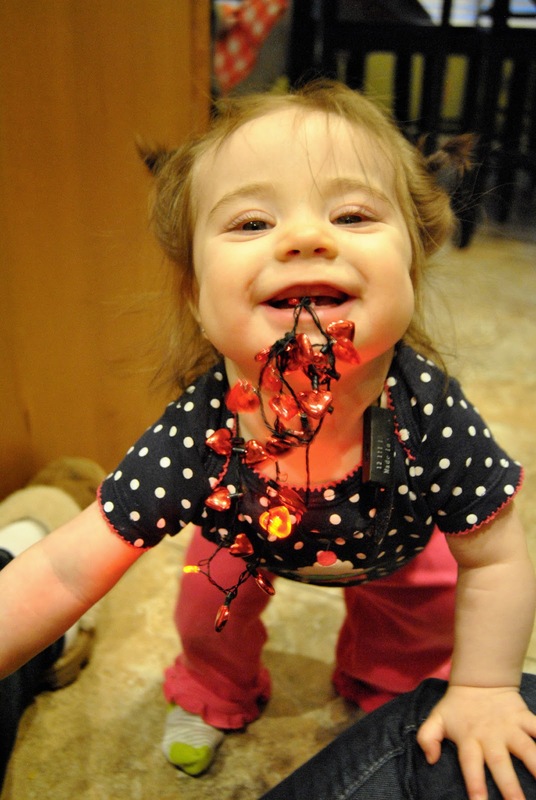 Last Friday, Ashley came down to spend the night and the kids were playing in the living room. 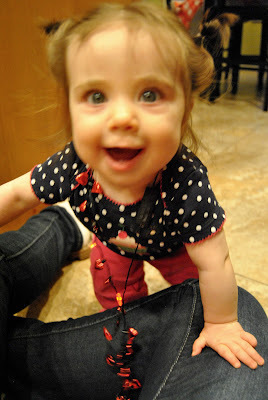 Brooklyn was playing with her necklace down by my feet. Pretty soon she stood up and crawled in my lap. I could tell she was having a hard time swallowing, like something was stuck in her throat. I instantly knew what was wrong and started to panic a little bit inside (outside I was trying to remain calm). She had swallowed a heart off the necklace. I had checked the necklace multiple times and didn't think there was a way she could get the hearts off, but apparently she had chewed through the string with her new teeth. 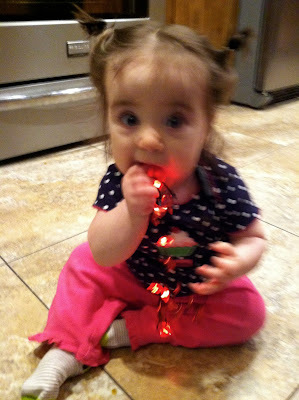 I turned her upside down and tried to knock it out, but it didn't seem to help. I knew that since she could breathe and swallow the Heimlich wouldn't do anything to help her. I watched her really closely and decided to try and nurse her and if that didn't help I would take her in to the emergency room. After nursing her she seemed fine and ready to go play again. I said a little prayer that she would be "ok" and asked for the Spirit to be with me as a mom to know if something was really wrong. SCARY!!!! brilynn literally almost died last winter because she choked on a grape. i called 911 and everything. she couldn't breathe, she was turning blue, the heimlich wasn't working. i finally stuck my finger down her throat far enough that she threw it up. it was AWFUL. i mean AWFUL. i still have visions of it. i still don't allow my children to eat grapes and anytime they cough or make a weird noise while they're eating my heart skips a beat. it was terrifying as a mom. there's no way to protect your children from EVERYTHING! 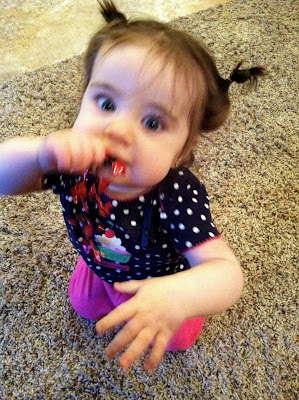 i probably would have let her play with the necklace too! you're a good mama! i'm glad she's ok! Oh my you need to hang out with me more...I would make you feel so good...we have had our fair share of choking moments. One time Sydney actually swallowed a penny in the pediatricians office. It went down but the dr turned to me and said "why do you let her play with money?" yes I just hand over money and let them play with it. Isn't it a toy? I felt stupid. She had gotten it out of my wallet while we were waiting for the Dr. to come in. So glad Brooklyn is ok. The necklace looks like the best toy ever. Really.